PDF is the most common document format because of its better ease of reading and portability. So, there is a common need for converting other document formats including images to PDF file. Commonly it is done via virtual printer software where the output is PDF file. doPDF from Softland software is a nice software in this category. It is Free, does not require 3rd party software and barely uses any resources during conversion. Select and convert: Creating PDF files is as simple as selecting the file you want to convert and clicking a button that will start the actual conversion (you can also print to pdf via the virtual doPDF printer). 400+ document types supported: the principle is this, if a document type is printable, then doPDF can create a PDF file out of it. This is why you can convert documents such as: DOC, DOCX, DJVU, XLS, XLSX, XPS, PPT, PPTX, DOT, EML, VSD, PUB, PUBX, MPP, WPD, OpenOffice, DWG, HTML, TXT, PNG, JPEG, GIF, TIFF and many others. No GhostScript or .NET: doesn’t require 3rd party programs to make PDF files such as GhostScript or runtime environments like the .NET Framework. This makes the setup file to be incredibly small compared to other free PDF printer programs. Consistent PDF look: To ensure that the resulting PDF file will look exactly as originally intended, doPDF embeds by default the font subsets used in the original document. Industry-standard PDF files: doPDF creates standard PDF files, meaning you will be able to open them with any free PDF reader (i.e. Adobe Reader, Foxit PDF Reader, Sumatra PDF Reader, Nuance PDF Reader). Not only that but the content of the PDF file is searchable, meaning you can search for text within the created PDF file (and search engines will also index the text from the PDF). doPDF is avilable for download from the following links. Its a 4 Mb installer, digitally signed with Softland S.R.L. doPDF Installation requires administrative rights and 13.8 Mb of free disk space. The Installer is available in 33 languages. You will get an option to set doPDF as the default printer. At the end of installation you will be offered to open product webpage and also to launch doPDF. It is Free for both personal and commercial use and works on Windows 7, Vista, XP, 2008/2003/2000 Server (32 and 64-bit). doPDF is easy to use. 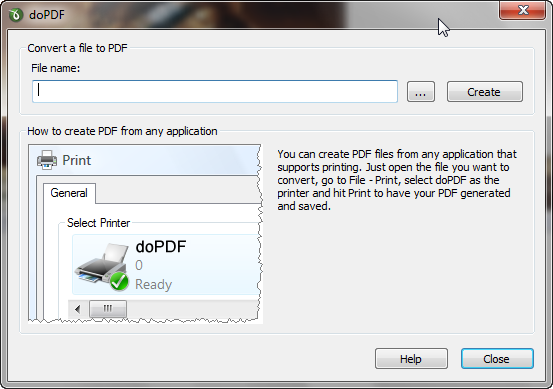 You can create PDF either by using the GUI or via printing the document using doPDF printer. See the video demo for detailed instructions. I am a long time user of doPDF. I like it since it suites my need perfectly. If you need more power upgrade to NovaPDF. This entry was posted in Document Management, Format Conversion, Free, PDF, Software, Windows and tagged Softland, Virtual Printer.